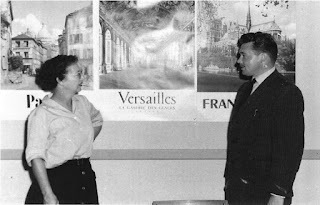 Mary Rowan Johnson and Jean Nicaise in Room 202 at D-B - 1958. Translator's note: Square brackets [ ] enclose clarifications or explanations. [Sic] means the previous word appears as per the original. [in English] - I came to fight with General Robert E. Lee and his courageous Confederates. This outrageous proclamation provokes a moment of sharp surprise followed by a burst of laughter. Thus from the outset am I adopted by the Deep South in the person of little Mary Johnson. Every time she introduces to her friends "the Belgian teacher who is replacing me," she adds, "And do you know what his first words were? 'I came to fight with Robert E. Lee and his courageous Confederates. Ha, Ha, Ha!'" It doesn't take long to recognize that the memory of what we call the War of Secession, and which Americans call the Civil War, still remains extremely strong in the conquered South, although its 100th anniversary was due to be celebrated in three years. It's even possible to say that the wounds it caused haven't yet healed. The red Confederate flag, barred with a diagonal blue cross struck with stars, is unfurled at many such occasions as balls, marriages, and funerals. The city of Bristol where we disembark is cut in two. The border between Virginia and Tennessee runs down the middle of Main Street! Mary points out the Virginia side of this important street, with its considerable collection of "pubs;" meanwhile the Tennessee side is devoid of them. Thus we learn that the State or rather the county where we are going to live is still under Prohibition! Mary drives very carefully and scrupulously observes the speed limit. All the other drivers are doing the same, since no one passes us. To a European it seems like the speed limits are quite slow. Several advertising billboards announce the approach of cities and towns. We are especially surprised to see, along with ones promoting Coca Cola or Camel, immense signs with the words: "Jesus Saves," or "Try to be there when Jesus comes." And to be sure of being there when Jesus comes, it would be a good idea to follow the advice shown for lovers: "Don't drive cheek to cheek." Upon our arrival in Kingsport, we are assaulted by the lingering odor of products related to the evil alcohol: methanol and acetone. An enormous Eastman Kodak factory fills the atmosphere with the emanations of solvents used in the manufacture of cellulose acetate-based textiles, film, and plastic. This first, olfactory contact with the city where we'll have to live for a year is truly not all that agreeable. This city is really quite young, not only on a European scale, but also on an American one. Its history reproduces in miniature that of a New World approaching dominance of the Old by virtue of the vigor, courage, and perseverance of a population descended from pioneers. The first whites, almost all proud WASPs (White Anglo Saxon Protestants) of Irish or Scottish origin, didn't settle on the site until 1748. They found a fertile valley basin protected from the winds by wooded hills of oak and chestnut and watered by the two branches of the Holston River, which flows into the Tennessee, itself a tributary of the Mississippi. It is here that the Holston became navigable for flatboats and opened the way to the West. The Cherokee Indians were at first well-disposed with regard to the pioneers. However a war broke out in 1761. It was only ended in 1777 by a treaty that left the natives bereft of their best land, and as a consequence the white invaders lived with no guarantee of safety until 1812. Today the Cherokee are kept on a reservation to the east of here, partly in North Carolina. Slightly more than 1500 of them make a living from small-scale agriculture and tourism in a wooded, gently-rolling region, the Smoky Mountains, which is comparable to our Ardennes even though it is obviously larger. Autumn gold is scattered in the splendid foliage of these mountains so often crowned by a veil of fog, hence the name "Smokies." On the Holston a river port was begun that was first known as the Boat Yard, then as King's port, not because any king had stayed there, but because its owner was one Colonel King, a veteran of the American Revolution, and this was quite simply his port. Small industry sprang up, centered essentially on the river traffic and the shipyard: a sawmill for processing the abundant primary natural material; a foundry fueled by charcoal; blacksmith's, a flaxseed oil press, a tannery; a cotton mill and a flour mill. The river provided the necessary driving force. [Here Nicaise in a footnote explains that the English word "mill" can mean a place for milling or for manufacture.] A village of 50 families grew, with its two stores, two churches, two saloons, and two doctors. Alas, in 1861 came the Civil War. The population took an active part in the war. It was torn between its allegiance to the Federal government and its love for the South, where it was rooted. Divided by the suspicion and hatred that characterizes all civil wars and decimated by military raids, the little community emerged bled dry by the worst internecine conflict ever to grip the American people. The new railroad toward the West, which went through Bristol but bypassed the little village, made things even worse because it displaced the river. Kingsport only emerged from its ensuing sleepy isolation when a private company, as appropriate in the country of free enterprise, set its sights on a railroad connection between Charleston, S.C., and Cincinnati, OH. The line was never completed, but in its initial stages it crossed eastern Tennessee from south to north and joined Kingsport to Bristol in 1909. From here the village began again. The first industries to start up are a brickyard and a cement plant, which find on the spot the necessary clay and gypsum. By rail comes a stream of other primary materials from nearby locations: sand, rock, and silica for making glass, and abundant, high-quality coal extracted from surface mines in nearby Virginia and the other neighboring state, Kentucky. The re-birth happens almost as quickly as the demise. And then the enterprising people of the revived village have an idea characteristic of the pioneer spirit. In 1915 they have urban planners from the famous Massachusetts Institute of Technology draw up a plan for an entirely new village. It was a plan that from the outset made allowances for a foreseeable expansion. Zones were clearly delineated. The residential section comprised lots with generous dimensions. It was well-separated from an industrial area that was amply furnished with land near the train station. Between the two would be built a commercial zone centering on a large avenue, Broad Street. There would be no buildings taller than two stories. The United States isn't, as some people imagine, a country of skyscrapers. These appear only in the largest metropolitan cities. And again, in 1999, the European Union, no matter how unanimous, was quite incapable of making Milosevitch see reason without the military help of the USA. Without sophisticated American air power, the cruel Serbian dictator guilty of genocide would have continued in Kosovo the "ethnic cleansing" begun in Bosnia with 200,000 dead. Alas, America--up to now without rival, too sure of itself--will take a fatal step in 2003. In launching a war against Iraq without the support of the United Nations, George W. Bush will unleash universal hatred of the USA and provoke the mobilization of the Muslim world. This invasion, I fear, will be the first battle in a War of Civilizations that runs the risk of soaking the 21st century in blood.